After work, I met with my friend to get my collection from our e-load and prepaid card business. I was surprised that he got me a new book. 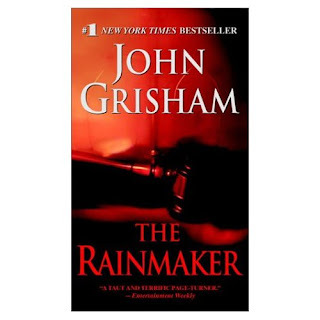 Actually I was requesting a second book from BookSale so it would be cheap, but instead he gave me a new book, The RainMaker by John Grisham. It would be my 6th book from John Grisham. I can’t wait to finish the four books I bought last week so I could read this one. Anyway, I keep on hearing the radio ad of Christina Aguilera’s Concert here in the Philippines at The Fort on July 6, 7 P.M. I desperately want to watch this concert. I already texted my friends, but no one has no interest in watching. Anyone who has connections or wants to watch this concert, please ping me. CHRISTINA ROCKS! Hope you get that chance to watch her live! What's your favorite Grisham book so far? My favorite is The Testament and Runaway Jury. Have you also tried reading David Baldacci? Thanks for the comment tactology and nina! @tactology: i hope i can watch it. sigh! @nina: my favorite Grisham books are The Testament and The Firm. I'm not familiar with David Baldacci though.